Over 300 men, women and children joined Mid Michigan Community Action in the Clare City Park for the third annual “Hot Wheels” car show to celebrate the importance of positive male role models in the lives of children. Mid Michigan Community Action’s Fatherhood Involvement program aims to help fathers, grandfathers, brothers, uncles and all males to become actively involved in the development of their children. Many were attracted to the assortment cars, motorcycles and off-road vehicles. 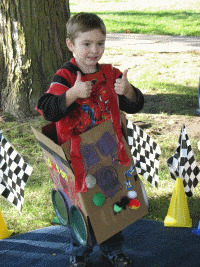 In addition to the cars, several events including picture frame building, toy car building and painting, and cardboard box-car races made the event memorable for kids and adults. Free hot dogs, popcorn, cotton candy and refreshments were also served with homemade hot dogs being donated by J.T. Bakers.